Best of luck pigeon-holing Leo Rondeau, the man or his music. The North Dakota-born, Austin, TX-based singer songwriter boasts about as many influences and textures as a patch quilt of found fabrics. A distinctly Italian first name, a last name that describes a form of old French poetry, and enough Native blood in him to be able to say in one song on his latest album Take It And Break It that his ancestors “fought the white man,” Rondeau speaks for many voices of the American experience. He’ll throw out a Cajun tune complete with accordion, and transition from rock to folk without a blink. But at his core is a country music songwriter in the legendary Austin mold, wowing you with his ease at turning a phrase and illuminating emotion and perspective in his songs. For years Leo could be seen holding down a residence at Austin’s famed “Hole In The Wall” venue, and playing his part in a defiant scene of independent-minded country musicians, some of which appear on Take It And Break It like Jim Stringer, Brennen Leigh, and Beth Chrisman of The Carper Family. These artists both create a support network, and push each other stylistically. And as a respected songwriter, Rondeau songs have been recorded by folks like The Carper Family and Mike and the Moonpies. Take It And Break It affords nine new original tracks from Rondeau, and is produced by R.S. Field who has previously worked with folks like Billy Joe Shaver and Hayes Carll, and produced Justin Townes Earle’s first two LP’s. In Rondeau’s “Here’s My Heart,” he reveals the dichotomy inherent in many males—one of displaying a bellicose, bawdy front to the world, while hiding an inherently fragile romantic state beneath. “Bound To Be A Winner” has one of the most finely-crafted choruses you will find, reminding you of Tom Petty in his prime in its distinctly American candor and tone. “When It Was Around” also speaks to Petty in its driving beat and infectiousness. “Blackjack Davey Revisited” is pure poetry from Rondeau. Its wit is delivered with dizzying rapidity, while the melody takes you right to the time and place of its sad story. “Alligator Man” gives Take It And Break It a bit of a spicy Cajun kick, while the epic “Whaler’s Tale” finishes out the album in an immersive audio experience. For years I’ve believed that Cajun music sits right on the edge of a big revival, just like we’ve seen recently in other sectors of the roots world. Rondeau could be an artist who has just enough Cajun texture mixed with country and rock sensibilities to benefit from that wave if it ever occurs. But even if it doesn’t, Leo Rondeau is a songwriting lifer who you sense takes a wide, patient perspective, and has a belief in the power of song to outlast trends, obscurity, or even a song’s original creator when it is approached with heart. Rondeau and Take It And Break It are probably not for everyone. There was a slight lack of presence on this album that I found hard to pin down or explain that may hold it at arm’s length from some listeners. But this album has a great spirit and is a worthy receptacle for these original songs that now get to go out into the world and find inviting hearts. I have little to no control over what people see in those ads. They are generated based off of what Google thinks you want to see from your browsing history, etc. If I see an ad like that, I can trace it back and ban it. I am seeing an ad for WSM’s archives on CD. Nice tune in that Youtube vid. I’ll check him out. This is my first time commenting but I have checking this site for a couple years. Never had heard of this guy, till now, and it’s awesome! I have discovered many singers/bands from this site, so thank you for all you do! I once rode this guy’s coattails, a long time ago in North Dakota. Lost track of him for a while, and it doesn’t astonish me in the least that he has parlayed a consummate gift for delivery and craft into such a flawless album. Each song outstrips the next. 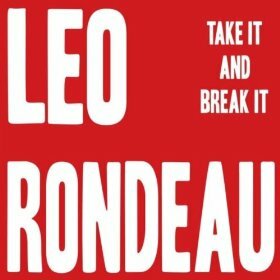 Leo Rondeau’s “Take It And Break It” is not to be missed. Also – pedal steel on the new album really reminds me of the pedal steel on Jim Lauderdale’s Hummingbird album is that maybe the same production or player? First time I hear his name, first time I hear his music, and I like it. I love a cajun-twist in music, and I think R.S. Field might just be the right man to make it sound right. It’s almost a guarantee to sound good when R.S. is at the wheel, Webb Wilder’s LP It Came From Nashville was my introduction, this cd proves he still knows what he is doing, I would buy it at a gig.